I have a bit of a love-hate relationship with my head of hair. Often I find myself admiring others – how does she get so much volume? How have those curls stayed in all day? Why can’t I suit that style? But I definitely think in recent years I’ve found a cut which works for me, and I’ve learnt how best to style it. One thing that’s been lacking though, is my care for my hair. Sure enough, I wash it every few days, but quite frankly, I don’t really care what I’m putting on it. 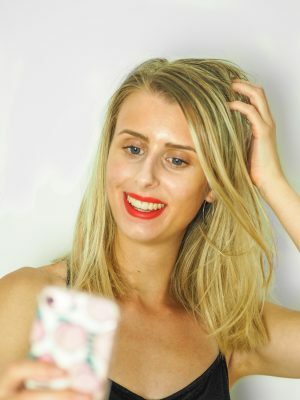 Yeah, I have a haircare routine but am I actually caring for my hair? Probably not. When Therapi got in touch with me, this could all change. 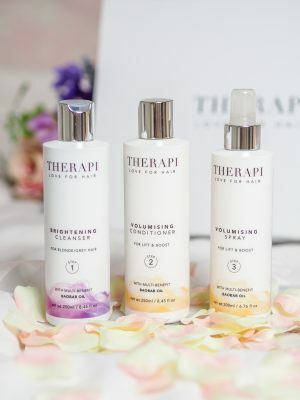 Therapi is a new British haircare brand that recently launched. The brand was born out of a desire to offer a luxury salon professional hair care range bursting with benefits, whilst maintaining an affordable price point. The defining ingredient, which is used in each and every one of their products, is the multi-benefit Baobab Oil. This is a light oil that has miraculous moisturising, strengthening, repairing and conditioning properties, leaving all hair types with extraordinary shine. As well as this, Therapi products give extreme heat protection, contain colour lock technology, protect against UV rays and are all paraben and sulphate free. Sounds good, right? Therapi asked me about my hair and sent me some products perfect for me: their brightening cleanser, their volumising conditioner, and finally a volumising conditioner spray. I told them I had coloured blonde hair and often struggled with any kind of texture or volume so I was pleased to see these goodies in the box that showed up. So far I’ve been enjoying the 3-step process. The brightening cleanser is the first step and essentially shampoo. It’s designed to be used only once a week due to the brightening properties – aiming to get rid of any brassy tones in blonde hair. I’m quite new to purple shampoo, despite having coloured hair for 4-5 years now. First impressions of this particular purple shampoo were that it was quite runny in consistency – for me almost too runny. It lathered up well though, and with a couple of uses I can see it’s lightened my hair ever so slightly. I’m long-overdo some new highlights, in fact, I’m booked in for them in a couple of weeks so I’d be keen to see the result when my hair’s not so grown out. The next step is the conditioner. I never skip conditioning in my regime, due to being coloured my hair simply wouldn’t cope! In comparison to the cleanser, the conditioner was a lot thicker in texture, something I really liked. Using this for a few weeks now, I seem to have a little bit more ‘oomph’ in my hair, Despite being volumising, I felt it still left my hair silky smooth. The final product I was sent was from Therapi’s style range. They sent me their volumising spray which has to be my favourite of the spray. Designed to give a bit more volume and texture to the hair, this does just that. A mixture between a more wet spray and a hairspray, a few spritzes of this and a quick flick of my hair upside down and I’ve instantly got that extra little bit I’m looking for. The lovely team at therapi have got in touch and provided me with a code to share with my followers to receive a free Therapi candle when buying any other two products. To get your free candle simply pop in the code AJC93LC in the order comments field during checkout. Overall I’ve been loving this little switch up in my haircare routine, and I’m excited to see how my freshly cut and dyed blonde locks react to it in a few weeks time! What are your fave products in your haircare routine? *This post contains gifted products.